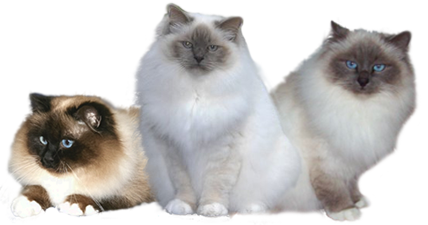 1) Birman breeders shall breed with the intention of improving the standard of the breed, before monetary gain. 2) Breeders will not sell their kittens under the age of 10 weeks. 3) All kittens sold will be vaccinated against F.I.E and Flu, and be issued with the relevant vet certificate. They are also to be microchipped and the relevant papers supplied. 4) Kittens will be in good health, free of parasites and house trained. The new owner will be supplied with details of their kittens usual diet and litter tray material. (b) Registration certificates must not be supplied until kitten is desexed and recorded as a spay or neuter. 6) The breeder must evaluate honestly any kitten sold for breeding or showing to ensure it conforms to the standard without major faults. 7) All relevant papers (registration and pedigree), shall be supplied to the purchaser for transfer of ownership for breeding and show kittens. If the papers are not available at the time of sale, a written guarantee must be supplied stating that they will be forwarded as soon as possible. 8) After sales help and guidance will be available to all buyers to ensure every kitten settles into its new home with minimum of trauma. 9) Responsibility will be accepted by the breeder for the kittens' health and welfare for a period of 14 days after the kitten has moved to its new home. New owners complaining of health problems with their kitten must verify their claim with a veterinary certificate. 10) Stud services will be available only to registered Birmans, from registered catteries, thus discouraging "backyard" breeders. 11) The breeder will agree to abide by the price guide set by the Club. As a general price guide a kitten buyer should expect to pay up to approximately $900.00 for a desexed, vaccinated & microchipped kitten for 2019. 12) All members shall ensure that at all times all their cats are properly housed, fed, watered and receive veterinary care when required, and shall generally show responsibility by the way their cats are kept. 13) No advertising or marketing on public media and no deposits to be taken on unborn kittens.